A missing tooth can do more damage than simply leaving a gap in your smile. When missing teeth are not replaced, more complicated problems can develop, such as bone loss, gum disease, or poor occlusion. 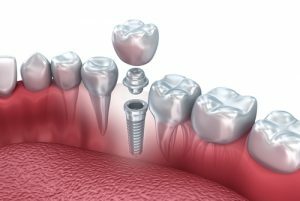 Though dental implants and bridges can both successfully restore the form and function of the smile, each has distinct advantages. Dental implants look and act exactly like normal teeth and require no extra maintenance. Conversely, a bridge is fixed in place between the two adjacent teeth, which can make thoroughly cleaning this area more difficult. Some patients choose a bridge due to a lower upfront cost or because they do not have sufficient jawbone density for a dental implant. However, Dr. John D. Beckwith often recommends dental implants for candidates who want a restoration that provides maximum stability and durability. To learn whether a dental implant or bridge is best for you, please schedule a consultation with Dr. John D. Beckwith today.